When Is DECT Best For Gout Diagnosis? For the last 3 years, there has been interesting news about Dual Energy Computed Tomography for gout diagnosis. Each year, roughly coinciding with annual rheumatologist meetings, we have seen reports of the amazing ability to see uric acid crystals in places previously hidden. This year is no exception. Whilst the latest report shows that DECT is not the ultimate gout diagnostic tool for all situations, it does have a firm place in the rheumatologist’s toolkit. I have reported on DECT For Gout Diagnosis earlier, and there are several more references, which you can find by entering DECT into the search box above. The latest report was presented at ACR Annual Scientific Meeting in November 2011, and the abstract follows. Dual energy computed tomography scanning (DECT) is highly accurate in detecting and classifying renal uric acid stones. This technology has recently been modified to detect intra- or peri-articular monosodium urate (MSU) deposits. We aimed to formally assess the accuracy of this new imaging method to diagnose gout and explore whether it may have any substantial impact on clinical decision making beyond the established diagnostic approach using polarizing microscopy of synovial fluid. To assess the sensitivity and specificity of DECT for diagnosis of gout, we included patients into two prospective cohorts: A control cohort of subjects without any history of gout who underwent arthrocentesis for other types of joint disease, and a second cohort of subjects with active gout diagnosed with a combined reference method of polarizing and electron microscopy. Accrual was stratified according to joint location and duration of symptoms (?6 weeks/>6 weeks) in order to capture a wide spectrum of disease. 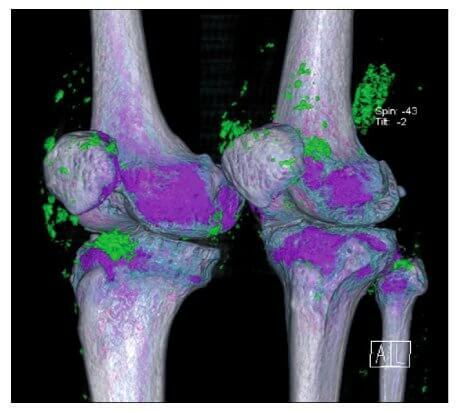 All study participants underwent dual source, dual energy (80 and 140 kVP) CT scanning of the aspirated joint. Images were classified by a musculoskeletal radiologist as positive or negative for MSU deposition. To explore the diagnostic yield of DECT scanning, we assembled a third cohort of subjects who had clinical suspicion for gout but from whom an appropriate synovial fluid specimen for analysis could either not be obtained, or polarized microscopy was negative for the presence of MSU crystals. These subjects then had DECT imaging of the affected joint area. If the imaging findings suggested the presence of MSU deposits, we performed an ultrasound (US) guided aspiration of these areas with subsequent polarizing microscopy. The sensitivity and specificity of DECT for diagnosing gout was 0.93 (95%CI 0.79-0.98) and 0.95 (95%CI 0.82-0.99), respectively. These estimates were based on 40 patients with confirmed gout according to the reference method and 40 control patients with other types of joint disease. All 3 false negative subjects were observed in the stratum of 10 patients with acute podagra and no prior episodes of joint pain. The 2 false positive patients had advanced knee osteoarthritis with a DECT signal indicating intracartilaginous uric acid deposition. The diagnostic yield cohort consisted of 30 subjects with a clinical suspicion for gout but a negative synovial fluid aspiration. DECT imaging showed evidence for uric acid deposition in 14 of these 30 patients (46.7%). Ultrasound-guided aspiration of areas with positive DECT findings confirmed the presence of MSU crystals. DECT imaging provides high sensitivity and specificity for detection of MSU crystal deposits in subjects with gout. 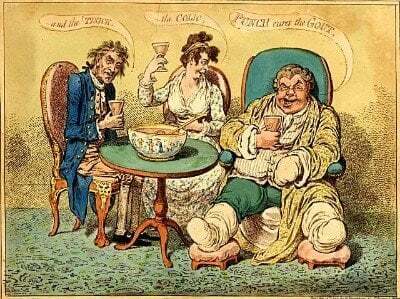 Sensitivity appears to be lower in patients with acute symptoms and no prior history of gout. DECT is a high-yield test with significant impact on clinical decision making when gout is suspected based on clinical presentation but polarizing microscopy of synovial fluid fails to demonstrate MSU crystals. This investigation confirms the earlier findings that DECT is excellent at showing the location of uric acid crystal deposits around joints. As in earlier studies, the technique often shows crystals in joints before they are subjected to an acute gout flare. Again, in the real world, most of us are a long way from this, as DECT facilities are few and far between. However, this does not prevent treatment, and so if gout is suspected, despite a negative joint fluid analysis, it may be best to start treatment to get uric acid in the blood down to 5mg/dL (0.30mmol/L). Leave When Is DECT Best For Gout Diagnosis to browse the Gout Symptoms section.